UPDATE – This deal is no longer at the sale price. There is a DEAL ALERT at AMAZON. For those Xbox gamers out there or if you want to give a gift to an Xbox gamer, Amazon has the deal for you. 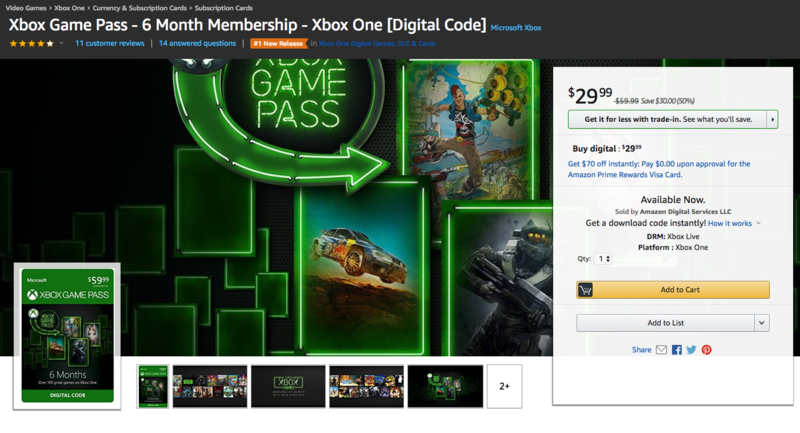 The Xbox Game Pass 6 month membership for $29.99. Usually the membership is $9.99 a month (or $59.99 for 6 months). For those not familiar with the Xbox Game Pass, it is similar to Netflix but for gaming. Xbox Game Pass provides access to over 100 games each month for a flat monthly fee. Keep in mind that you can use more then one $29.99 Game pass offer on the same account.